Have you taken a 21st century hot tub for a test drive lately? If not, you’re in for a big surprise. The vessels have come a long way since the 1980s-themed days of recent comedy film hit Hot Tub Time Machine. And nowhere is that more evident than in the choice of musical options. It’s now possible to bring the outdoor stereo system right into the water with some models, in the form of embedded underwater speakers and a patch bay with full iPod and MP3 inputs. If you’ve never been in a hot tub with surround underwater sound, you’re in for a treat. For those who like their music and relaxation to have more of a New-Age flavor, there’s also the similar and equally mind-blowing option of fully integrated aromatherapy. That’s right. 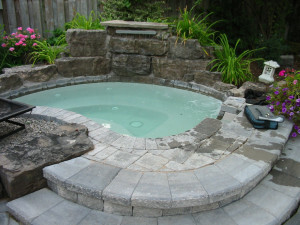 Hot tubs today can come equipped with the ability to mete out aroma treatments into the water right. It’s a new age for hot tubs all right; the new age of unlimited options. But perhaps the best-kept secret of today’s hot tub options is the one involving salt. Instead of fresh water, more and more owners are opting for a saltwater-filled hot tub. The chemical upkeep is much simpler, for one thing. Once the proper pH levels have been reached, it’s a matter of just topping off with a little salt now and then. Just like saltwater pools, the upkeep is simpler and less rigorous. And, as per the aforementioned aromatherapy, the feel of salt water on the skin can be magically softer and more soothing. There is also some added buoyancy, though in the case of a hot tub-sized quantity of water, this will be somewhat negligible. ALD is up on all of these and the many other remarkable extras that can be used to enhance a backyard, balcony or veranda hot tub. The ways in which leisure time of this nature can be enjoyed are virtually limitless. The only limit is the individual budget. If the idea of adding a private water feature such as a spa or hot tub to your landscape plan sounds good to you, give us a call and we’ll work out the details!